Need advice on how to level up your Prayer skill to a certain goal in World 31, Taverley or Yanille e.g. level 1-99 Prayer , level 99-120 Prayer , or 200M XP in Prayer ? Worry no more, as we are here to help guide you through the best methods so that you level up your Prayer very fast and efficiently. For more immediate assistance, you are more than welcome to join "Altar" Friends Chat in-game, or Discord. Step 1: Move Your POH to Taverley or Yanille. Once you have bought a POH from an Estate Agent (look for this icon on the minimap) for 1,000 coins, you are able to move your POH to Taverley for 5,000 coins (this is reduced to 2,500 coins if you have completed the Varrock Elite achievements). Once you have at least level 50 Construction, you are able to move your POH to Yanille for 25,000 coins (this is reduced to 12,500 coins if you have completed the Varrock Elite achievements). To do that, talk to any Estate Agent (look for this icon on the minimap). Prifddinas, south-east corner of the Ithell district. Step 2: Once your POH has been moved to Taverley or Yanille, make sure the "Portal" radio button is selected for the "Teleport arrival location" option. 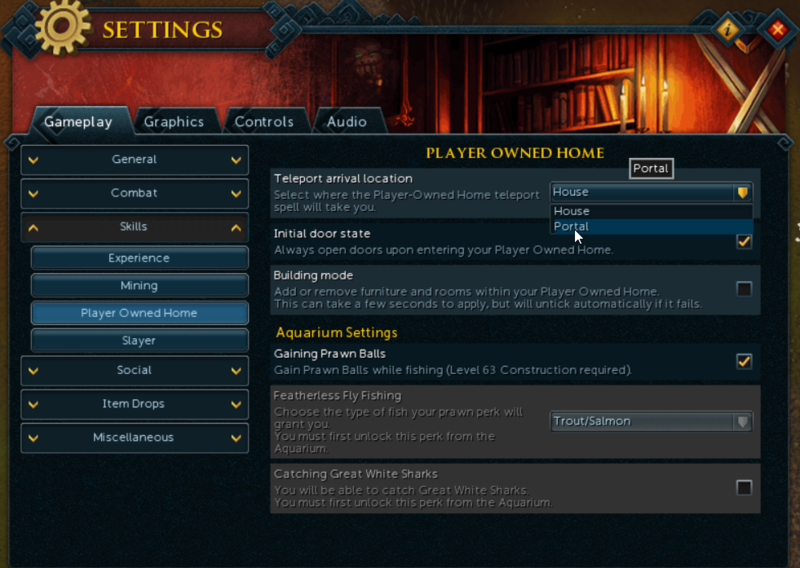 It is located in the "Player Owned House Settings" under the "Gameplay" tab. 1. Right click your Teleport to House tablet . 2. Click the "Modify" option in the right-click menu. 3. Choose the "Taverley" or "Yanille" option in your chatbox. 4. Choose how many tablets that you would like to modify. Step 1: Prepare your Beast of Burden familiar and inventory with un-noted bones or ashes. Step 2: Break your Teleport to House tablet or Teleport to House tablet (chipped) i.e. Taverley Tablet . Alternatively, teleport to Taverley in World 31 using the Taverley Lodestone if you have not bought a POH from an Estate Agent for 1,000 coins to move it to Taverley for 5,000 coins (this is reduced to 2,500 coins if you have completed the Varrock Elite achievements). 1. Teleport to Burthorpe using the Burthorpe Lodestone (unlocked automatically). 2. Run due south until you get to the Taverley Lodestone to activate it. For more information on how the Lodestone Network works, go to this section: Bone Running Efficiently in Taverley. Step 3: Type in the desired host’s name by clicking "Enter friend's house" after right clicking the purple House Portal north of the Taverley Lodestone. To find out the host name, feel free to ask our community in "Altar" Friends Chat. After you type the host name for the first time, the "Last name entered:" will appear in the chatbox. You can click on that to enter the host's house instead of typing the host name manually. Step 4: Use your bones or ashes on the Gilded altar by right clicking the altar and clicking "Offer". The Mounted Glory to Alkharid. The Ring of Duelling to Castle Wars. The Ring of Fortune or the Luck of the dwarves to Grand Exchange. Or the Tokkul-zo (recommended) to Fight Kiln (best), Fight Cauldron (second best), Fight Pit (third best), or Fight Cave (fourth best). The Tokkul-zo is obtained from The Elder Kiln quest. Step 2: Break your Teleport to House tablet or Teleport to House tablet (chipped) i.e. Yanille Tablet . Alternatively, teleport to Yanille in World 31 using the Yanille Lodestone if you do not have level 50 Construction and have not completed the Love Story quest. 1. Right click your Ring of Duelling (purchasable from the Grand Exchange in Varrock or Prifddinas). 2. Click the "Rub" option. 3. Click the "Castle Wars Arena" dialogue option. 4. Run due east until you get to the Yanille Lodestone to activate it. For more information on how the Lodestone Network works, see the next section: Training Prayer Efficiently in Yanille. Step 3: Type in the desired host’s name by clicking "Enter friend's house" after right clicking the purple House Portal east of the Yanille Lodestone. To find out the host name, feel free to ask our community in "Altar" Friends Chat. Taverley city in World 31 is becoming the main location where players train Prayer due to the close proximity of the lodestone and bank. It is located South of Burthorpe. There is no Construction level required to move your house to Taverley. That way you can use Teleport to House tablets to quickly teleport back to Taverley. If you have completed the Love Story quest, you can modify the Teleport to House tablet to Taverley. Otherwise, you can use the Taverley Lodestone instead. A bone runner can be a great way to quickly gain experience, but it can be a little costly such as 15,000-20,000 coins per inventory . Remember to activate (left click) the Taverley Lodestone if you have not done so already. If you are unsure of what it looks like, it is shown in the image below. Then you can teleport to Taverley instantly by right clicking the button near your minimap and clicking "Taverley". The image below demonstrates this. Alternatively, you can left click button near your minimap, and either click the Taverley Lodestone on the interface or press 'T'. The image below shows where the Taverley Lodestone is on the interface. Yanille city in World 31 is an alternative location where players train Prayer . It is located east of Castle Wars or South of Ardougne. Level 50 Construction is recommended as you will be able to move your house to Yanille. That way you can use Teleport to House tablets to quickly teleport back to Yanille. If you have completed the Love Story quest, you can modify the Teleport to House tablet to Yanille. Otherwise, you can use the Yanille Lodestone instead. A bone runner can be a great way to quickly gain experience, but it can be a little costly such as 15,000-20,000 coins per inventory . Remember to activate (left click) the Yanille Lodestone if you have not done so already. If you are unsure of what it looks like, it is shown in the image below. Then you can teleport to Yanille instantly by right clicking the button near your minimap and clicking "Yanille". The image below demonstrates this. Alternatively, you can left click button near your minimap, and either click the Yanille Lodestone on the interface or press 'Y'. The image below shows where the Yanille Lodestone is on the interface. We have a community dedicated to helping players find an open house. It has been open since 2008, so well over 9 years! Before following the steps below, remember to ensure that your "Friends" or "Friends Chat" is turned "On". You may need to do that for both interface modes if you occasionally use one or the other. Step 1: If you are using the EOC interface, hover your mouse cursor over the Community button on the Ribbon bar. Once you have done that, click the tab that is shown in the image below. Step 2: Click the icon at the bottom left of the interface. Step 4: You have now joined our community chat! To talk, you can either click the Friends tab and talk directly from there, or put a forward slash at the start of each sentence that you type. E.g. /Hi everyone! For those unsure how Gilded altars work, they alone give 250% of the experience you would have gained if you had buried your bones or ashes. They have 2 burners, one on each side. Each type of burner gives 50% bonus XP in Prayer if they are lit by a Tinderbox and Clean marrentills (purchasable from the Grand Exchange in Varrock or Prifddinas) requiring level 30 Firemaking , so it is a total of 350% bonus XP in Prayer ! Lit burners last between 2 minutes 10 seconds to 3 minutes and are usually lit by hosts nowadays, so you do not need to worry about bringing a Tinderbox and Clean marrentills . All you need to bring is your bones or ashes. You may also bring Beast of Burden familiars and/or Teleport to House tablets if you are going to use them. During DXP weekends however, Gilded altars do not provide additional bonus XP in Prayer . For those unsure what a Sip is or how they work, they provide 5% bonus XP in Prayer for 1 hour per dose. They are called Perfect Juju Prayer Potions in the Grand Exchange. Most hosts usually give one out for free to each player, so you do not need to spend your whole bank on them. Kindly ask the host for a sip once per hour, and they will gladly give you one. Baby dragon bones give 105 XP. Infernal ashes give 218.7 XP. Airut bones give 463.7 XP. Hardened dragon bones give 576 XP. Frost dragon bones give 630 XP. Reinforced dragon bones give 665 XP. Searing ashes give 700 XP. Thorny Snail at level 13 Summoning, which carries 3 items. Spirit Pack Pig (Tier 1) at level 14 Summoning, which carries 4 items. You create the pouch in the machine under Eli's farm, after completion of the Bringing Home the Bacon quest. You cannot purchase the pouch in the Grand Exchange. Spirit Kalphite at level 25 Summoning, which carries 6 items. Bull Ant at level 40 Summoning, which carries 9 items. Spirit Pack Pig (Tier 2) at level 44 Summoning, which carries 8 items. This also requires level 44 in Construction and Crafting , as well as 3 Oak planks , 2 Steel bars , and 3 nails of any type. Once you meet the level requirements and have the items in your inventory , you can then create the pouch in the machine under Eli's farm, after completion of the Bringing Home the Bacon quest. You cannot purchase the pouch in the Grand Exchange. Spirit Terrorbird at level 52 Summoning, which carries 12 items. War Tortoise at level 67 Summoning, which carries 18 items. Spirit Pack Pig (Tier 3) at level 84 Summoning, which carries 22 items. This also requires level 84 in Construction and Crafting , as well as 3 Teak planks , 2 Mithril bars , and 3 nails of any type. Once you meet the level requirements and have the items in your inventory , you can then create it in the machine under Eli's farm, after completion of the Bringing Home the Bacon quest. You cannot purchase the pouch in the Grand Exchange. Pack Yak at level 96 Summoning, which carries 30 items. Pack Mammoth at level 99 Summoning, which carries 32 items. You can either create the pouches yourself, or you can purchase them from the Grand Exchange in Varrock or Prifddinas. The only pouch you cannot purchase in the Grand Exchange is the Spirit Pack Pig. When using Beast of Burden familiars however, remember to take advantage of the Small Obelisks that are available in a players' home to fully restore your Summoning points , which are consumed each time you summon a familiar . They also drain slowly while you have a summoned familiar following you. If you do not have enough of those Summoning points , you will not be able to renew or summon another familiar . While training Prayer , the less time you have to waste getting your bones or ashes, the better. This is where bank presets come in handy. In your Hero interface or bank interface, you are able to edit and save presets that you would like to load when you press either '1' or '2' on your keyboard. The presets can load items from your Worn Equipment , Inventory , and/or Beast of Burden . If you are also using a Beast of Burden familiar , and you would like to place bones in your inventory and familiar at the same time, ensure that you press the radio button for the Beast of Burden preset at the bottom. In addition to that, click the cog icon of the preset that you are using to take out your bones or ashes, and then tick the Summoning icon . After that, save the preset, and you should be good to go. The images below demonstrate what to do, bearing in mind that the first image for both interface modes appears while you are accessing your bank account. First age tiara (1%). It is obtained from Treasure Hunter, or purchased from the shady ghost at the Ectofuntus for 1,000 ecto-tokens . Modified first age tiara (1%). It is made by using a First age tiara with a First age tiara add-on which is obtained from Treasure Hunter. In addition to the 1% Prayer bonus XP, it gives 1 Dragon bones a day or 3 if you have four or more pieces of the first age outfit. It also provides a teleport to your Player-owned house portal 3 times a day and a 2% chance of saving bones when used on a Gilded altar. First age ring (1%). It is obtained from Treasure Hunter, or purchased from the shady ghost at the Ectofuntus for 1,000 ecto-tokens . First age cape (1%). It is obtained from Treasure Hunter, or purchased from the shady ghost at the Ectofuntus for 1,000 ecto-tokens . First age bracelet (1%). It is obtained from Treasure Hunter, or purchased from the shady ghost at the Ectofuntus for 1,000 ecto-tokens . First age amulet (1%). It is obtained from Treasure Hunter, or purchased from the shady ghost at the Ectofuntus for 1,000 ecto-tokens . First age full set (6%). Clan avatar (3-6%). It provides 3% XP bonus plus your clan's fealty rank (0-3), providing up to 6% XP bonus in any skill. Your fealty rank is earned from capping at your clan's citadel on a weekly basis. To activate your weekly XP boost, right click the Avatar Control Stone in your clan's Avatar Habitat (located in the Town Square), and click "Attune to Avatar". Once you have done that, select the "Experience boost" option. Ensure that you summon the Clan avatar from your Pets interface to get the XP bonus. Corruption aura (1%). It is purchased from the Loyalty Programme Shop for 5,000 Membership Loyalty Points, and lasts for 1 hour with a 3 hours cooldown. Harmony aura (1%). It is purchased from the Loyalty Programme Shop for 5,000 Membership Loyalty Points, and lasts for 1 hour with a 3 hours cooldown. Salvation aura (1%). It is purchased from the Loyalty Programme Shop for 5,000 Membership Loyalty Points, and lasts for 1 hour with a 3 hours cooldown. Greater Corruption aura (1.5%). It is purchased from the Loyalty Programme Shop for 12,000 Membership Loyalty Points, and lasts for 1 hour with a 3 hours cooldown. Greater Harmony aura (1.5%). It is purchased from the Loyalty Programme Shop for 12,000 Membership Loyalty Points, and lasts for 1 hour with a 3 hours cooldown. Greater Salvation aura (1.5%). It is purchased from the Loyalty Programme Shop for 12,000 Membership Loyalty Points, and lasts for 1 hour with a 3 hours cooldown. Master Corruption aura (2%). It is purchased from the Loyalty Programme Shop for 30,500 Membership Loyalty Points, and lasts for 1 hour with a 3 hours cooldown. Master Harmony aura (2%). It is purchased from the Loyalty Programme Shop for 30,500 Membership Loyalty Points, and lasts for 1 hour with a 3 hours cooldown. Master Salvation aura (2%). It is purchased from the Loyalty Programme Shop for 30,500 Membership Loyalty Points, and lasts for 1 hour with a 3 hours cooldown. Supreme Corruption aura (2.5%). It is purchased from the Loyalty Programme Shop for 63,500 Membership Loyalty Points, and lasts for 1 hour with a 3 hours cooldown. Supreme Harmony aura (2.5%). It is purchased from the Loyalty Programme Shop for 63,500 Membership Loyalty Points, and lasts for 1 hour with a 3 hours cooldown. Supreme Salvation aura (2.5%). It is purchased from the Loyalty Programme Shop for 63,500 Membership Loyalty Points, and lasts for 1 hour with a 3 hours cooldown. Small fallen star (Prayer). It is obtained from Treasure Hunter, and has a one time use. Medium fallen star (Prayer). It is obtained from Treasure Hunter, and has a one time use. Large fallen star (Prayer). It is obtained from Treasure Hunter, and has a one time use. Huge fallen star (Prayer). It is obtained from Treasure Hunter, and has a one time use. Ectofuntus is located north of Port Phasmatys. Ecto-tokens are obtained at the Ectofuntus by filling up your pots with crushed bones by grinding bones upstairs using the bone grinder, and filling up your buckets with slime down the trapdoor on the ground floor. Offer them to the Ectofuntus based on the ratio of 1 bucket of slime per 1 pot of ground bones (1:1), and then talk to a Ghost disciple for Ecto-tokens . An Ectophial is recommended if making Ecto-tokens , as it is an instant teleport to the ground floor at the Ectofuntus. You receive it after completing the Ghosts Ahoy quest. There are four Loyalty Programme Shops; one located in Burthorpe near the Warrior's Guild with Xuan, one in the market square in Varrock with Xuan, one in the centre of Prifddinas with Dilwyn, and one in the Merchant District in Menaphos with Wafa. You are able to set a Level Target for the Prayer skill by right clicking it and clicking "Set Level Target". Alternatively, click "XP Target" if you wish to set a XP Target instead. Type your Prayer level goal . Then you can see how much XP is left until the next goal near "Remainder:". There are also Prayer Calculators out there to help you out. One of those calculators are found here.